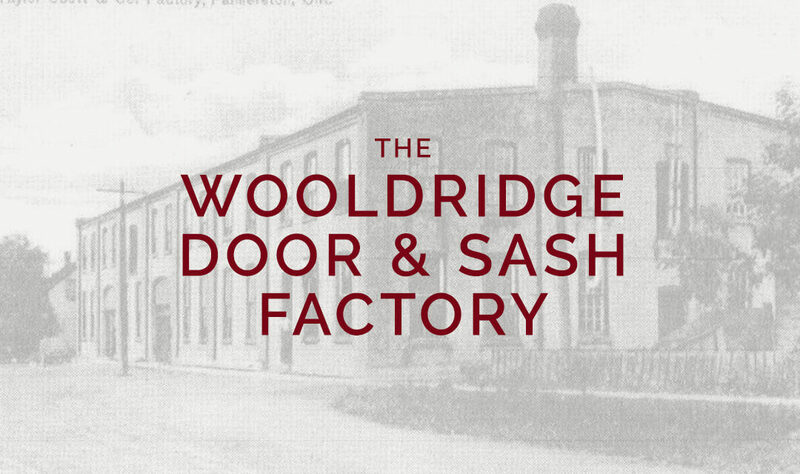 The Wooldridge Door and Sash Factory and Saw Mill was built in 1879, and destroyed by fire in 1905. Mr. Wooldridge learned the building trade in England. He settled in Palmerston over 30 years ago (1870’s) and since that time has always been a prominent figure in business circles here. He soon built up an extensive contracting business and erected a sash and door factory, a little later adding a sawmill. In May, 1905, these buildings were destroyed by fire. Mr. Wooldridge immediately commenced to rebuild on a much larger scale than before, and in the meantime occupied temporary quarters. The new factory is large, airy, well-lighted, substantially-built two-storey white brick, fitted with the most modern machinery and appliances. A new sawmill has been erected and these two buildings and yards occupy considerably over 2 acres. A system of blowers to collect the dust and shavings automatically is at present being installed in the factory. Mr. Wooldridge has added a new department to the factory for the manufacture of cheese boxes and expects shortly to be able to supply this, the greatest cheese district in Canada, with all the cheese boxes required. New machinery of the latest pattern has been installed and nothing but the best seasoned material will be used. Known to most Palmerstonians in 1975 as the “IXL” building, this name comes from the fact that it once was used to produce IXL storage batteries. But it served many purposes, being built originally as a sash and door factory by Major Wooldridge. On the postcard it is identified as “The Taylor, Scott Co., Woodenware, Palmerston, Ont.” And the photo shows the plant that stood on the east side of Norman St. where the O.P.P. station (former Palmerston town hall) stands. During its lengthy history, until its destruction by fire, it served purposes other than those mentioned. Parts of it have been used for the Brewer’s Retail; to service farm implements; and to produce chalk, modelling clay and wax crayons. It has also served as a spot for the manufacture of steel staircases for modem apartment and hotel buildings and ornamental iron railings. A small part of it actually served as a restaurant, operated by Alf Barnes, who called his place “The Hole in the Wall”. At one point in its history (1920’s? ), the building housed “Perry & Thorn’s Woodenware Plant”, operated by two men named Perry and Thorn. One well-known product of the operation was a hand sleigh. It had steel runners that were flexible, and were bent and twisted by a leverage linkage activated by a front-mounted crossbar. Known as the “Flexible Flyer”, and steering very well, they were a delight to thousands of young Canadians. The platform on them was quite high, being some eight inches off the ground, (or ice or packed snow), and they were indeed the Rolls Royce of hand sleighs. Today, the OPP offices and formerly the Palmerston Municipal Building, occupy the land of the former Wooldridge buildings.